One of our most popular crosswords is the Entertainment and Celebrity themed Crosswords. These are particularly popular with light-reading magazines and entertainment magazines. Topics covered can be specific to a medium, such as TV shows, or generic and cover the whole world of celebrity entertainment and the weird and wonderful things and people that it contains! We supply our themed Entertainment and celebrity crossword puzzles in PDF or EPS format, which you can then use and manipulate as you wish in your publication. 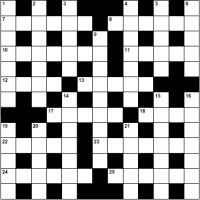 You can view a sample Entertainment Crossword online. If you would like to purchase entertainment themed crosswords for publication, please Contact Us with your requirements.